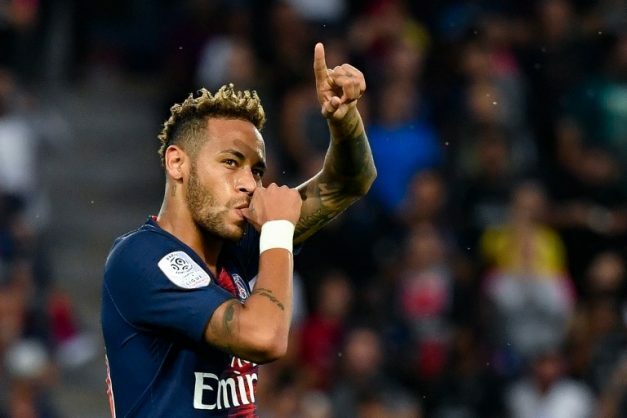 Neymar scored his first goal for Paris Saint-Germain since February as the French champions kicked off the new Ligue 1 season with a 3-0 defeat of Caen on Sunday. The Brazilian star, who scored 19 times in 20 league games before fracturing his foot last season, struck just 10 minutes into his first start for the club in almost six months. Adrien Rabiot netted a second for PSG before half-time and Timothy Weah, the son of 1995 Ballon d’Or winner and Liberia president George Weah, rounded out the victory with his first league goal. Gianluigi Buffon also produced a couple of sharp saves on his home bow in goal for PSG as coach Thomas Tuchel made a winning start at the Parc des Princes. “We played a good match with lots of intensity, especially in the first half. In the second half we managed things a bit more because we’re not yet at 100%,” PSG captain Thiago Silva told Canal+. German Tuchel, who replaced Unai Emery on a two-year deal, was without a host of first-team regulars as PSG’s trio of World Cup winners — Kylian Mbappe, Presnel Kimpembe and Alphonse Areola — showed off the trophy to fans before kick-off. Edinson Cavani and Marco Verratti were also absent as Tuchel handed starts to youngsters Colin Dagba and Stanley N’Soki in defence, and fellow 19-year-old Antoine Bernede in midfield. After appearing in a 15-minute cameo at the end of last weekend’s 4-0 rout of Monaco in the Champions Trophy in China, Neymar made a long-awaited return to the line-up in Paris. He needed little time to leave his mark as Caen goalkeeper Brice Samba was punished for a sloppy pass, with Christopher Nkunku setting Neymar up for a calm, side-footed finish on his left foot. Buffon, who was expected to retire at the end of last season before electing for a new adventure abroad, became the oldest PSG player in Ligue 1 history at 40 years and six months. The 2006 World Cup winner was called into action for the first time midway through the opening period when Malik Tchokounte’s firm volley forced Buffon to punch to safety. Angel Di Maria, on target twice in the victory over Monaco, laid the ball on a plate for Rabiot to add PSG’s second on 35 minutes. The Argentine winger’s acceleration took him past Alexander Djiku and into the Caen area where he crossed for a charging Rabiot to tap in from close range. Silva was indebted to the quick reflexes of Buffon on the stroke of half-time when an attempt to head clear a cross left his keeper scrambling to turn the ball behind. Stef Peeters had Buffon beaten after the break when his free-kick smacked against the inside of the post, while a combination of Samba and the woodwork then denied Weah on 85 minutes. But the US international pounced on another mistake by Samba a minute from time, Weah forcing the ball over the line after catching the Caen keeper in possession. Earlier, Bertrand Traore and Memphis Depay scored for Lyon in a 2-0 victory over Amiens. Burkina Faso forward Traore fired Lyon ahead on 24 minutes when he broke down the right side of the area and sneaked the ball through the legs of Amiens goalkeeper Regis Gurtner. Nabil Fekir, who came on as a substitute in France’s 4-2 win against Croatia in last month’s World Cup final, was not included in the Lyon squad having only returned to training on Monday. Bruno Genesio’s side coped without their captain as Dutch star Depay made the points safe with a terrific 20-yard free-kick on 75 minutes.